Completed in 1992, the short film No Regrets was filmed inside the Crown Hotel. The historic building served as a perfect location for the haunting tale. Local Citrus County community theater actors Jaret Lubowiecki, Paul Gagnon, and Denise Davis Herzig performed in the film while hotel co-workers worked behind the scenes to complete the 20 minute short. Watch the film and have a look, not only at the film, but inside the hotel at that time. Without debate, one of the most unique gifts that renovation brought to the hotel was the addition of the suspended, spiral staircase. The elegant fixture that became the centerpiece of the new hotel lobby was designed and built by the Driwood Moulding Company of Florence, South Carolina (www.driwood.com). the spiral staircase and extensive bannister. Executive Vice President of Driwood started with the company in 1971 at the age of 28 and has been with the company ever since. 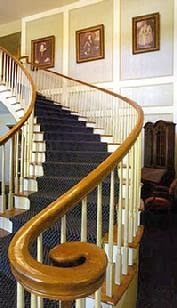 Despite the many projects he has helmed over the years, Mr. Gelzer recalls working on the staircase that his company designed specifically for the Crown Hotel back in 1980. A former pilot in the US Air Force, Mr. Gelzer would periodically fly his twin-engine Navajo airplane from Florence to Inverness in order to discuss the project and take measurements in preparation of the staircase. He recalls landing his plane on the rural runway of the Inverness Airport one time in particular when he was met by a Sheriff's deputy who questioned him as to the purpose of his visit. He assured the curious constable that he was there on legitimate business as part of the team renovating the old Colonial Hotel. And on another visit he made to Inverness in order to supervise workers who would perform the installation of the staircase, he was met with quite a unique site - the entire hotel was covered in tarps. One of the stages of the extensive renovation involved fully tenting the whole structure for termite fumigation - an event which accidentally coincided with his visit. Regardless of the challenges Mr. Gelzer met in Inverness, his two man crew of artists worked tirelessly back in South Carolina for over 12 weeks (in excess of 1,000 man hours) building and crafting the one-of-a-kind staircase. Once completed, the one-piece staircase was loaded onto a truck where it traveled almost 450 miles to Inverness. A testament to the true skill and craftsmanship of its designers and builders, the grand staircase installed with ease and took its proper place as part of the new hotel lobby. Mr. Gelzer and his team at Driwood created an object of art and wonder which, to this day, does not cease to amaze those who walk through the front doors. Despite the reported opening bid of $1.4 million, new owners Cary & Brenda Jensen purchased the hotel for just $900,000 on May 3, 2004. But they would spend another $200,000 transforming the building once again; this time into an assisted living facility called Crown Court. Today, the property continues to provide guests with a cozy, comfortable place to stay - just as it has for over 100 years. 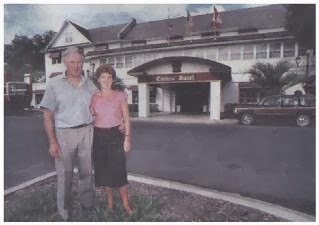 On November 30, 2001, the Sumners sold the Crown Hotel to husband & wife team Thomas Dryburg and P.C. Hyland. But dark days were just around the corner. Under the management of the inexperienced new owners, the business spiraled out of control, unpaid taxes piled up and the property fell into foreclosure in less than a year. was not enough to bring in much needed local business. By September 2002, local newspapers reported that the couple, accused of defaulting on a $1.15 million loan, had absconded in the middle of the night with a moving truck full of the hotel's furnishings & valuables, leaving the mortgage company, the state, and the employees unpaid. A management firm is hired to keep the hotel’s doors open as employees pick through the damage left by previous owners. INVERNESS -- With its pristine white clapboard exterior and navy-blue striped awnings, the Crown Hotel looks frozen in time from the outside, seemingly unchanged for at least the past decade. Inside, however, is a different matter. A week after assuming control of the aging Inverness institution, employees from a Jacksonville hotel management company are still trying to sort out the mess left by the previous owners, Thomas Dryburg and his wife, P.C. Hyland. The new managers have fought to keep the utilities turned on. Faulty air-conditioning units have been repaired and the filthy kitchen received a good scrub. But there's still a lot more work ahead, said Henry B. Fonde, senior vice president for Landcom Hospitality Management Inc.
"We have a ways to go," he said. "But you have to walk before you can run." Earlier this month, Circuit Judge Curtis J. Neal appointed Landcom to act as receiver until foreclosure proceedings are completed. The company will receive a $4,000 monthly fee from Small Business Loan Inc., which loaned Dryburg and his wife $1.15-million to buy the Crown. The loan company said the Crown owners defaulted on the loan. In exchange for its monthly fee, Landcom must keep the doors open and the money flowing, a formidable task given the hotel's current state of disarray. According to Crown employees, Dryburg and his wife spent Labor Day weekend loading a large U-haul trailer with bedding, pictures and furniture from the hotel. The security cameras had been removed from the lobby and the kitchen and bar had been stripped of provisions. While Dryburg and his wife told the workers they were leaving for vacation, Inverness police concluded they had absconded. Staffers from Landcom immediately began the task of rebuilding the landmark after the court hearing Sept. 6. A manager from the food and beverage division has inspected the kitchen, and a representative from human resources will arrive Monday to speak with employees. The hotel remains open, with a smattering of guests. The bar has reopened and is offering a limited food menu. But progress is slow, Fonde said. Employees have spent much of their time fending off angry creditors and taking stock of the items left behind. The Crown Hotel has a long and time-honored history in Inverness. Originally called the Orange Hotel, the building was constructed in the early 1920s, according to Inverness city clerk Marilyn Jordan. It was sold to businessman Lynwood N. Smith in 1959, who renamed it the Colonial Hotel. The building was dubbed the Crown Hotel when English investors refurbished it in 1981. The hotel was purchased by entrepreneurs Jill and Nigel Sumner in 1990. 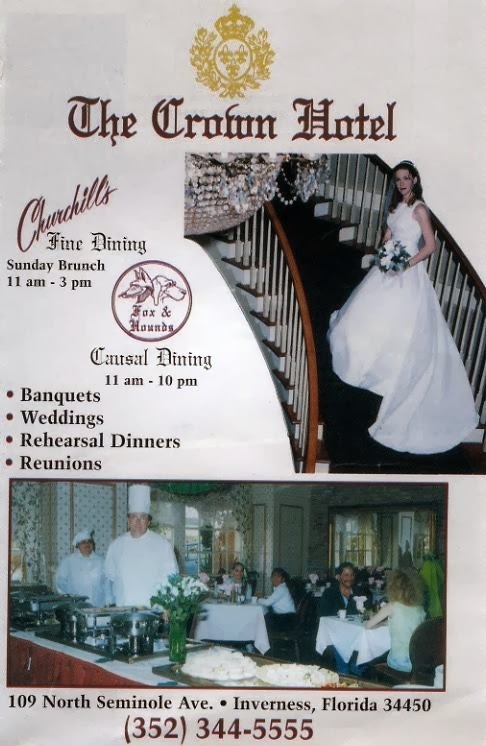 They operated the Crown until November 2001, when it was bought by Hyland and Dryburg, a Central Florida businessman who boasted of extensive hospitality experience, including stints as an employee at the Four Seasons Hotel in Philadelphia and as owner of properties in St. Augustine, North Carolina and Pennsylvania. The new owners immediately announced plans to restore the British-style inn and pub to its former glory. They also planned to add a European-style spa and transform the restaurant into a five-star gem. Just weeks after assuming control, Dryburg and his wife offended members of the Rotary Club of Inverness by abruptly announcing the club was no longer welcome to use the Crown's conference room for weekly lunch meetings. Inverness police officers were called to the hotel numerous times to investigate reported disturbances, and the structure caught fire in February, forcing about 10 guests to evacuate. Later that month, Hyland was accused of slapping a 66-year-old guest during a dispute on hotel grounds. The guest, Betty Anderson, said Hyland became enraged when she tried to redeem a coupon for a free meal. In June, the owners were accused of failing to pay nearly $3,000 in tourist tax, prompting the county to file a lien against the property in June. Staff turnover skyrocketed. All the while, Dryburg was failing to make monthly payments to Small Business Loan Inc. to repay the $1.15-million loan he used to buy the Crown, according to court records. Dryburg promised to pay $8,687 each month to repay the loan. However, he made only two payments, the last one in March, court documents showed. Small Business Loan filed suit in August, asking a judge to foreclose on the property unless Dryburg could repay the balance immediately. The disappearing act was a sad ending to the owners' strange tenure, local officials agreed. Mary Craven, the county's tourism development director, said the Crown has always been one of the county's largest draws for out-of-town guests. "It could be considered the tourism anchor for the Inverness area," she said. "It's regretable that it's in the state it has been reported to be in." Several large touring groups who used to book their clients at the Crown for at least one night had recently dropped the hotel from their schedules, Craven said. "The hotel has such a great reputation in Inverness . . . I hope it can be revived quickly," she added. Jill Sumner said she is "heartbroken" over the current state of the Crown. But she and her husband, who recently spent four months traveling through America, have no plans to buy back the property. "No way," she said in a telephone interview Friday. "They've done too much damage. In nine months, they've managed to destroy everything we had worked for." Sumner said she had misgivings about selling the building to Dryburg and his wife from the very beginning. But he had assured them he had big plans for the hotel and would take good care of it. "He told us all these wonderful stories and I believed him," she said. The building had fallen on hard times when the Sumners purchased it in 1990, and it took them nearly eight years to turn it into a money-making operation, Sumner said. She fears the next owners will have an equally daunting task before them. "I just hope someone will buy it who has a lot of money and is willing to put in a lot of work," she said. -- Carrie Johnson can be reached at 860-7309 or cjohnson@sptimes.com. On April 24, 2003, with the foreclosure proceedings finally complete, the court put the hotel in the hands of the lender, the Small Business Loan Source out of Houston, Texas. In an effort to keep the foundering business afloat, SBLS hired Landcom Hospitality Management, Inc. in Jacksonville, Florida to operate the hotel until it could be sold. Unable to attract a suitable buyer, the hotel sat on the market for a year prompting SBLS to put The Crown up for auction with an opening bid of $1.4 million. On October 1, 1990 the Crown Hotel was sold to a private family from Wales. Nigel and Jill Sumner, along with their teenage children Caroline and Simon, moved to Inverness to operate the hotel. Proprietors of two other hotels in the past and having just sold one, the Sumners were originally looking to Florida for retirement when they stumbled upon the property. after purchasing The Crown Hotel. Despite the previously reported $1.7 million appraisal of the hotel, the Sumners purchased the property from Epicure for only $1 million. This time, in an effort to lower overhead costs, cuts were made from the top; General Manager Ian Young and Chef Dennis Malone moved on. Only Assistant Manager Keitha Stoney would remain to help the Sumners run the hotel. The Crown Hotel in the early 1990s when it was sold to the Sumners, a hotelier family from Wales. The Sumners would successfully operate the hotel for almost twelve years before once again opting for retirement. In late 2001, they offered the hotel for sale. An evening view of the hotel circa 2000 under the ownership of the Sumners. The Crown Hotel impressed guests from all around but just a few years in, the business struggled to turn a profit. On July 2, 1986, the St. Petersburg Times reported an outside investor would be buying stock in the business. INVERNESS - Shares of the Crown Hotel may be sold soon, but that doesn't mean things at the grand old Inverness inn will change much, says Michael Kovach, president of the company that owns the hotel. The hotel is currently owned by Epicure Investments, Inc., a wholly owned subsidiary of the British firm Epicure Holdings. A group of American investors is negotiating to purchase a "large portion" of the stock, but less than half of it, Kovach said. Kovach declined to name the prospective buyers or the amount of the purchase. He would say the investors are not local. "It's a little early to tell you," he said. Kovach, who was involved with the hotel's massive renovation project, said it is worth more than $3-million. The building, more than 100 years old, was turned into a showplace in 1981 after years of decay. The hotel has not changed hands since the renovation was completed. Little of the day-to-day operations at the 34-room hotel and its adjoining gourmet restaurant, pub and antique store will change if the sale goes through, because control will remain in the hands of Epicure Holdings, Kovach said. "It would just be an investment for (the party considering the purchase)," Kovach said, "These people are very excited about our territory." Kovach, who owns shares in the parent company, said he will probably no longer preside over the local company if the transaction is made. It was later reported that an unnamed Buffalo, New York investment firm purchased interest in the hotel for $1 million. And, while some staff chose to leave the company, major department heads like General Manager Ian Young, Assistant Manager Keitha Stoney and Chef Dennis Malone remained with the property. Downtown Inverness. Citrus Times, February 15, 1990. Photo by Bob Moreland. This infusion of cash may have helped save the hotel for a while but the Crown Hotel continued to hemorrhage money and just four years later, on March 31, 1990, The St. Petersburg Times would report the Crown Hotel was up for sale. 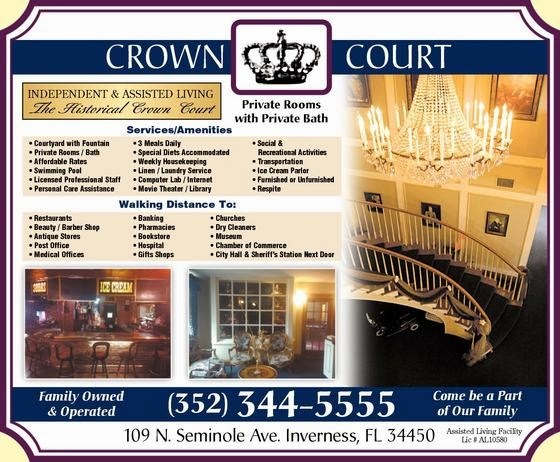 INVERNESS - The Crown Hotel, promoted by Citrus County business leaders as the elegant symbol of what downtown revitalization can accomplish, is for sale. The owners have pledged to keep the turn-of-the-century hotel open until a buyer is found, said Keitha Stoney, assistant manager, "We're still in business," she said. "Everything is continuing as always." According to a prospectus prepared by the hotel's operators, the property at 109 N. Seminole Ave. has been appraised at $1.7-million. The business, which includes 34 hotel rooms, a restaurant for formal dining and a pub, has been operating at a loss for each of the last three years. Last year, the loss totaled $137,000, down from $166,000 in 1988. The 1987 loss was $96,000. The Crown is owned by Epicure Investments, Inc., which, in turn, is owned by Epicure Holdings, a British company. Epicure Investment Holdings bought the hotel in 1981 and spent more than $3-million on renovations, transforming the place into a prime attraction for Citrus County. The Crown began as a general store in the mid-1890s. That building was moved several times in the next few years, eventually settling on Seminole Avenue and becoming known as the Colonial Hotel. Epicure renamed it the Crown Hotel and bedecked it with replicas of the British Crown Jewels. One of the primary investors in the hotel recently had a serious heart attack. In a letter to newspapers, general manager Ian Young said the hotel was on the market because the man's family "would like him to slow down and divest himself of some of his investments." Stoney would not identify the man. She said a few prospective buyers have looked at the hotel but there have been no serious offers. "This isn't the kind of property that sells right away. It could go on forever," she said. In recent weeks, business at the hotel has declined. Stoney and others attribute the drop in guests and restaurant patrons to a persistent rumor that the Crown is going out of business. "We hear it every day," Stoney said, "Our customers come in and say it. Local business people come in and say it. We try to track down the sources, but it's coming from all parts of the community." She said, however, that the Crown is committed to staying open. "We play a vital part in the economy of Citrus County," she said. "We bring so many people into this area. That's our goal." But selling the hotel didn't take as long as some might have thought. By June 6, 1990, The St. Petersburg Times was reporting that a sale was just around the corner. 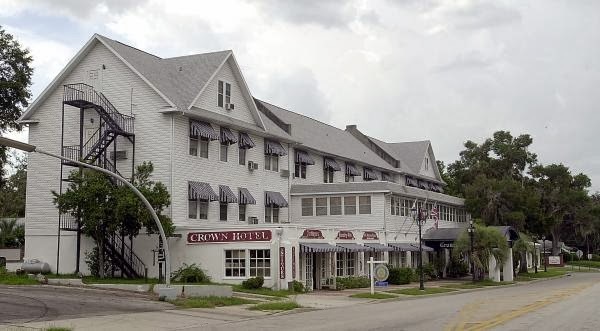 INVERNESS - A prospective buyer is showing interest in the Crown Hotel, the historic inn that has been on the market for three months, a hotel employee said Tuesday. Sheila Mohs, the sales and marketing representative, said she has been told that contracts may be exchanged in the next 15 to 20 days. But she stressed that neither a price nor a closing date has been set. "There has at this point been no offer and no acceptance," she said. Mohs would not disclose the identity of the prospective buyer and said that other parties have looked at the hotel. The 34-room hotel at 109 N. Seminole Ave. has been appraised at $1.7-million, according to a prospectus. It has lost money for the last three years. The hotel is for sale because one of the major investors had a heart attack, and his family wants him to give up some of his investments, General Manager Ian Young has said. Epicure Investments, Inc., which owns the hotel, is looking for a buyer who wants to continue operating the hotel and become a part of the local community, Mohs said. Epicure is a subsidiary of Epicure Holdings, a British company. 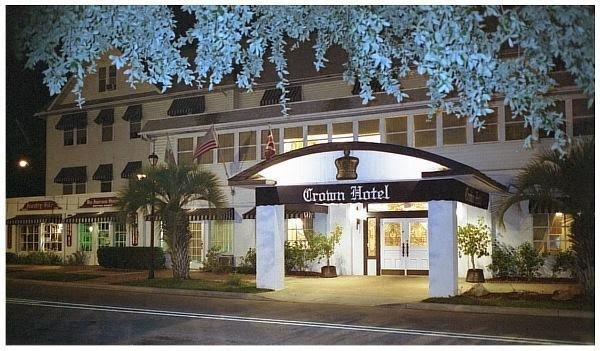 The Crown Hotel opened nine years ago after $3-million in renovations transformed the building, known previously as the Colonial Hotel and the Orange Hotel, into a British-style inn. 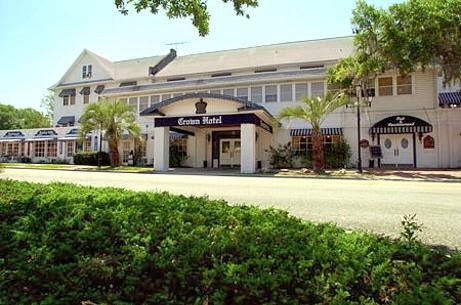 Quickly becoming the star of Inverness and Citrus County, The Crown Hotel was the darling of travel scribes who wrote countless vanity pieces about the hotel for newspapers, magazines and books. The Crown's Dining room suggests Victorian comfort - chairs upholstered in red felt, gold draperies and crystal chandeliers. More informal is the hotel's pub, where you can throw darts and sip ale. December 29, 1982. A view of the new Crown Hotel. Citrus Times. Photo by Rick Spence. January 1, 1983. "Lighted by a huge chandelier, the Grand Stairway leads to the second floor." Citrus Times. Photo by Bob Moreland. January 28, 1982. The Bridal Suite on the third floor of the new Crown Hotel. January 28, 1982. Mirrored corner of Churchill's Restaurant in the new Crown Hotel. 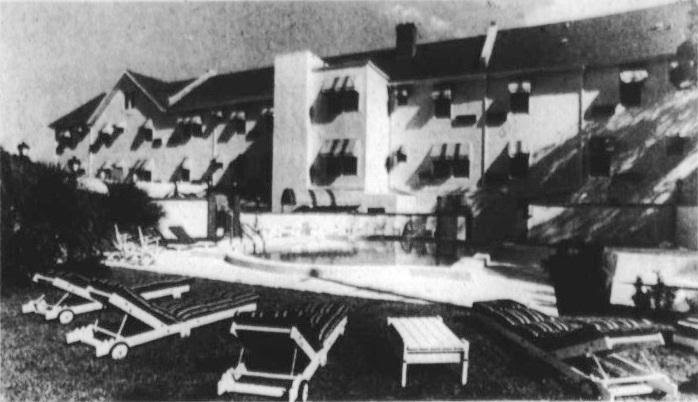 St. Petersburg Times, January 3, 1983 - "The pool area in back of the hotel includes a dining area."